Porta Rossa winery occupies the premises of a former Napoleon's style palace built to order of Assic, captain of the french army. Inspired by the vast territory, its magnificent scenery and the wine-making characteristics of the zone, Assic decided to stay and construct the building that even today is recognised by its ancient Vermilion entrance door. 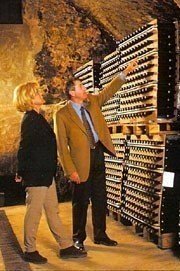 From then on, tradition has always gifted the place with culture and the names of renowned personalities: Colonel Giuseppe Castellazzo, of the royal House of Savoia, started rational vinegrowing and destined the palace to viticultural activities. King Vittorio Emanuele II, an expert in wine matters, an infallible hunter and an inveterate lover was an honourable visitor of the palace during many idle autumns in the Langhe Territory. The tradition of commitment to this land has found a deserving heir in the current owner of the house, Enologist Pierfranco Bonaventura, who has worked in the winemaking field for several years. His expertise is paired by his's passion for the winery. In fact, Luciana collaborates actively in publicity projects and in the pursuit of the winery goals. A legacy of tradition and wine-making devotion that converge at the work in the cellar and the respect of the objectives envisioned, i.e. putting the name of PORTA ROSSA next to that of best world class wines.